Michael Moreci and Kyle Charles are closing out 'Roche Limit Clandestiny' in style. It's only the penultimate issue, but the fireworks get started early as the crew try to survive amid a barrage from a relentless enemy. Langford lays out the dreary picture for Sasha and Elbus as existentialism takes a backseat to some high-powered science fiction action. Moreci transitions from his more contemplative narrative to straight horror sci-fi mode with ease. The dialogue continues to be crisp and natural even as the team is under attack. Over the run of the series, Moreci's character development has evolved organically and now we're more invested in what happens to them and with issue four the proverbial sh*t hits the fan. The tandem of Moreci and artist Kyle Charles work seamlessly together in the storytelling to bring a singular vision to the page. Charles extracts as much terror as possible from a mostly shapeless monster that at times overwhelms the crew. The action is staged and choreographed with the proper amount of chaos and dread. At times claustrophobic and disorientating at others, the suspense is inherent in every panel. It lends resonance to Langford's dire warning of the monster reaching Earth. Frankly, this type of action and weight in a penultimate issue is uncommon. Usually, it's a long set-up towards an action-packed finale. Moreci instead honors the story as the arc approaches its zenith with the stakes getting higher and higher. 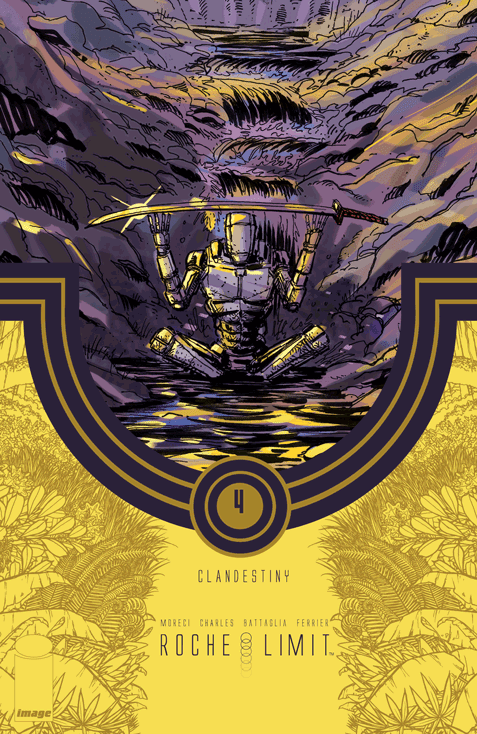 With its philosophical quandaries already established and the extinction level threat revealed, 'Roche Limit Clandestiny' continues to shine as one of the smartest and original sci-fi comics available.